Один из лучших официально бесплатных гитарных AMP VST плагинов. 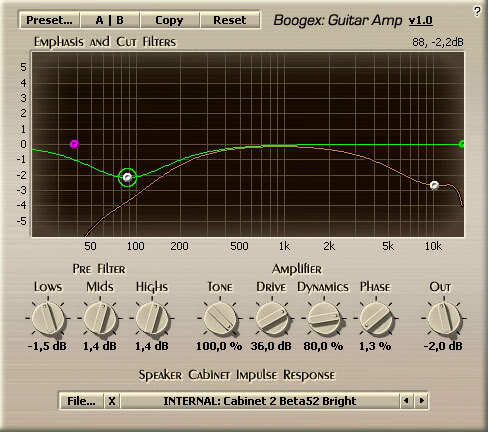 Boogex features emphasis filtering stage - a very powerful tone-shaping stage that is used to shape the sound of the amplifier. Pre-filtering is used to filter the incoming guitar signal. This is usually useful if the pickups on the guitar are too boomy or too crisp. This can be also used to shape the sound. Amplifier part is usually represented by a single Drive knob on the real guitar combos. This concept has been refined in Boogex and it was made possible to get very different overdrive tones using its four Amplifier knobs. Boogex is also able to apply any speaker cabinet impulse response (selection of built-in impulses is available). Processing latency is very modest - 96 samples (2.1 ms at 44.1kHz). 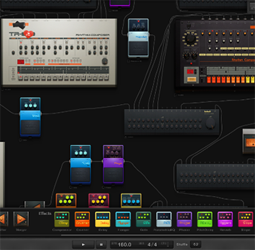 Boogex comes with several example factory presets.